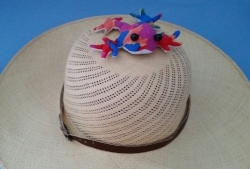 May I introduce Frederick the Frog and Lizzie the Lizard who are going to be my teaching assistants as we look at a simple and fun way to communicate one of those pesky grammar points: Prepositions of Location. Frederick the Frog is next to Lizzie the Lizard. On, in, along, next to, under, behind, near by, on top of, inside, in front of, in the back of, in the middle of………. Prepositions of Location may seem like insignificant tiny little words, but they convey a powerhouse full of meaning. For example, what’s the difference between these two statements? A. Bernie is in back of the van. B. Bernie is in the back of the van. Let’s compare. First of all, the sentences are exactly the same, except that Sentence B. includes the word THE. Those three little letters change the entire meaning of the sentence. In Sentence A, Bernie is OUTSIDE of the van and standing behind it. In Sentence B, Bernie is INSIDE the van sitting in the back seat. Since Prepositions of Location are some of the most feared little words students of English must master, why not make it fun for them! In my college level ESL Grammar class, I used to dread the day I had to teach Prepositions of Location. Students glazed over after just five minutes making the remaining 55 minutes of class a real drudgery. Then I brought out Lizzie and Frederick. These little sand filled carcasses made the class come alive. Even the men enthusiastically engaged with this lesson—especially once we started throwing Frederick around the room! We passed an entire hour with Prepositions with the help of Lizzie and Frederick. 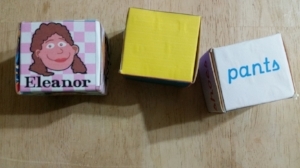 My choices of names even had a language practice objective as “L” and “F” sounds were a bit difficult for the first language group I was teaching. Frederick and Lizzy are inside the hat. Frederick is on top of the hat. Lizzy is around my finger. Lizzie and Frederick are in the middle of the table. Frederick is on the left side of the table. Lizzie is above the hat. Frederick is behind the hat. Lizzy is between the hat and Frederick. Frederick is in my hand. Frederick is on my hand. Lizzie is on the right side of the table. Lizzie is under the hat. Lizzie is under the hat and Frederick is on the hat. Alright, so what can you do if you don’t have Lizzie and Frederick? Improvise. Use a koosh ball, a pencil and paper, people in the classroom, a wadded up piece of paper, drawings, or create photographs showing the prepositions of locations you wish to teach. Christmas is a prime opportunity to introduce cultural backgrounds associated with North American holiday celebrations. Gift giving is one of those Christmas traditions. Here’s an activity that will practice speaking and grammar while sharing the Christmas tradition of gift giving. · Eleanor got yellow pants for Christmas. · Bruce received flowers and a robot for Christmas. · Nit wants jewelry and perfume for Christmas. · I’m giving my sister some flowers and a teddy bear for Christmas. · My grandfather received some flowers and a robot for Christmas. Students work in groups to read and/or write the sentences, then share with the class.